You may ask yourselves why I have gathered you here today. It has not been long since we last convened; indeed we met only yesterday on the sixteenth of November, a day in many ways like any other. It was a nondescript Wednesday that we may have stumbled through in a haze - of caffeine withdrawl or general existential malaise - absorbed in our daily tasks, concerned perhaps with the shifty characters of the Republican primary or what was left in the fridge. Yesterday was like any other day, which leads me to what I want to talk to you about today. At the end of last class, Mr. Zigler explained to us the premise of our fifth assignment. Addressing the sea of apathetic upturned faces, Zigler told us that we were each to write a speech that centered around a "straw man" argument. This, he said, will be really one of the only rhetorical techniques that "you will actually use in your Dilbert lives." The conversation carried on. After a few final questions, class was dismissed, and we dispersed, returning to our respective basement suites and library carousels. Nobody seemed to care about Zigler's dismal forecast - nobody gave his turn of phrase a second thought. It was just a snide remark, unpremeditated and harmless enough. He even got a few laughs out of us. My friends, I stand before you today imploring you to realize that this is no laughing matter. This prevailing attitude of fatalism and cynicism confronts us day in and day out. 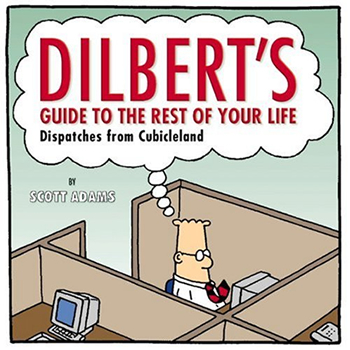 In Zigler's comment about our "Dilbert lives" we find the familiar joke: we are the joke. And we have become so accustomed to such paternalistic undercuttings of ourselves and our prospective futures that nowadays we scarecly bat an eye. Retract that - we do not bat an eye at all - ever. It is understood with almost mathetmatical certainty that our liberal arts education combined with our modest ambitions and talents (even more modest still) will lead us down a path of mediocrity. Mediocre intellect, mediocre relationships and jobs, mediocre ambition, all the way down to our mediocre graves. It isn't personal, it is just a statistical truth. Or so we are made to understand. Such are the stats and patterns that chart the inevitable compromise of our values and humbling of our spirits. Those who are supposed to support and inspire us are constantly patronizing our creative efforts and ambitions -- though never in the sense of funding. We go to school, and maybe we go to more school. We get a job, and maybe we get another job. We get in debt, and maybe - probably - we get more debt. It would appear we are trapped -- doomed to make a living selling stolen office supplies. And though we are reminded ad nauseum that we are unremarkable entities of a faceless crowd, each one of us alike, homogenous in potential and ability, we cannot help but feel isolated. Uniform hopelessness alienates us from one another and from ourselves. This ideological oppression that masquerades as "realism" is what constites our "Dilbert lives". We won't swallow it anymore. They try to tell us about us, as if they know us better than we know ourselves. We hear that there are no jobs for us, no pension plan and no tuna left either. But louder than this: we are told that we don't have the ingenuity to create opportunities for ourselves, to live and love what we do. They tell us we will settle in time, "they all do," they say, but they are wrong. We will never become complacent and measure out our lives in coffee spoons. (1) Trying to predict us is futile; we contain multitudes. If we can be certain of nothing else, when the economy is down the tubes and general unrest pervades, we can be certain of this. The systematic dismantling of our aspirations looms before us. There are days when the security of a life in middle management seems a welcome respite from the aching uncertainty -- so we have been led to believe. And if we sigh away our ambitions, the middle is where we will be lucky to land. My friends, the middle is for roadkill. They want to reap the imagination and energy of our youth in exchange for a dental plan. We know better. And we want more for ourselves. "It is a truth universally acknowledged that an aimless twenty-something in possession of a liberal arts degree must be in want of a nine-to-five job." (2) Or a lottery ticket. Or something like that. Of course, we do not feel much pride or prejudice anymore. We have exchanged those fiery emotions - expressions of an idealistic youth - for the sedate disenchantment we've been bred into. The transition has been so seamless, we hardly notice when our friends and teachers make passing references to our "Dilbert lives". But when I look in the mirror, I do not see a pallid engineer with an unruly tie, or a take-no-nonesense triangular hair-do. So I think there is still hope. But I suppose it depends -- while the question has not yet become rhetorical - what do you think? 2. "It is a truth universally acknowledged, that a single man in possession of a good fortune must be in want of a wife." The opening sentence of Jane Austen's Pride and Prejudice. Lucy Cameron studies English Literature and Philosophy at McGill University, Montreal.